We just want to quickly go over what to expect during the second week of your purchase if you’re using a mortgage. After the first week, we’ve already had you meet with the lender, make your deposit with the title company, order the appraisal, and order the inspections. So in Week 2, we’re going to see the results of those things. Your appraisal is either going to get done and we’ll get the report back for review by the lender and review by us, or it will be very soon; we’re going to get the inspection reports back in hand if we don’t have them already; and we should be getting the disclosures and reports from the title company and the seller, if we don’t have them already. We’ll take a good look at all those and make sure if we have the appraisal done, that there are no issues with the value. We may have to go back and renegotiate the price, or there may be some appraiser-required repairs. Sometimes they’ll point out something that, from a lender’s point of view, they want to have taken care of – and usually, honestly, it’s just something as simple as there’s a smoke detector that needs new batteries or it’s missing, or a carbon monoxide detector that needs to be put in place somewhere in the house. Occasionally, there are more expensive or difficult things, but that’s pretty rare; usually, we’ll have noticed those when we first looked at the home. As far as the inspections go, we’ll take a good look at those, determine if there are any real serious problems that make us want to cancel the purchase or renegotiate either getting a reduction in price or a credit from the seller – basically money to help you cover your closing costs in lieu of repairs to the property. And the third thing that we’re going to be doing is taking a look at the disclosures and reports we got from the title company and the sellers. And usually, there’s no big surprises there; just routine, straightforward information. Last but not least, your lender may be asking you for a few last bits of paperwork to complete your loan file, because once they have the appraisal back, they want to have a complete package they can submit to the underwriter for approval. And that really should be wrapping up what you’re going to be doing during Week 2. One minor thing: if you haven’t already, you should get a quote from your insurance company to get coverage in place on the home, because your lender’s going to require you to have that. So rather than have that be a last-minute thing, you can get some quotes and decide what the right coverage is for you. If you have any other questions or want to go into more detail, please call, text, or email. We’ll be happy to answer them. We wanted to talk about what you’re going to do in more detail with your lender, especially in the first week after you get acceptance of your offer. Basically, you’re going to get with your lender so they can disclose to you the terms of your loan. They’re required by law to do this, and they’re actually required by law to have the numbers they disclose to you at the beginning match very closely with what the numbers are at the end. There can’t be any big increase in fees that catches you by surprise; if so, they’ve got to go back and readjust. Lenders don’t want that to happen, and neither do you, so it almost never does. Once you meet with the lender, they’re going to run your credit if they haven’t already. They’re going to complete the loan application interview if they haven’t already – just some basic information about your employment, date of birth, Social Security number, where you’ve lived and so forth, income, expenses. They’re going to ask you to provide the last two years of tax returns and generally the last two months of bank statements. If you have investment accounts, other kinds of financial records that affect your application, they may ask for those as well. And basically, you can expect to get a checklist from them of what you need to bring to your appointment.? While you’re there, they’ll also get a check from you, typically for about $450, to order the appraisal of the property. Once that’s done, they’re going to wait till the appraisal comes back; they’re going to take all the information you gave them, and assuming it’s complete, they’re going to submit it to underwriting. Once your file’s in underwriting, you should have loan approval in two, maybe at the most three days. Either you’ll get full approval with no conditions, or you’ll get what’s called conditional approval, where they’ll say “Well, you’re approved, but we need to see your most recent pay stub, your most recent bank statement,” or some other factor like that – which is usually pretty simple and easy to provide. Once you’ve got that taken care of and have full approval, they’ll order your loan docs. They’re going to want to get verification that you have insurance in place, so just in case something happens to the home, that insurance will take care of it and that doesn’t turn into a problem for your lender. And they’ll generate the loan docs, which is basically the promissory note and other papers you’re going to sign just to take responsibility for the mortgage. Your lender’s going to be keeping in touch with you week by week and as they need to about getting information, and we’ll certainly be there by your side in that process as well. And I think you’ll be actually happy and surprised how quickly they can move things along. We’ve actually had people close a purchase transaction in as little as 11 or 12 days after we got their offer accepted. Generally, it’s more like 17 to 21 days. Some of the stories you may have heard from people are like 35 or 40 days or longer; that typically doesn’t happen with the lenders we recommend that you use, and the only thing that would really push the process out that far would be if you were taking advantage of down payment assistance. We’ll do another video on that, to go into that subject in more detail; it’s a bit of a specialized topic. So I hope this helps answer your questions about the loan process. If you have any others, please call, text, or email us. We’ll be happy to answer them. What About Inspections? Which Ones? Who Do I Use? During the first week after acceptance of your offer, we typically order inspections of the property, just to make sure that we’re very clear about its condition and to find out if any repairs are needed, anything that we should be concerned about, and get a ballpark idea of how much that’s going to cost and therefore decide if we need to either renegotiate the price with the seller or ask for a monetary credit from the seller to compensate for those. The inspections we generally recommend include a pest inspection, which looks for termites and other kinds of bugs that eat wood. It also focuses on damage from water, particularly plumbing leaks or water landing on the roof or getting sprayed on the house from sprinklers – anything that could deteriorate especially wood and other parts of the structure. That generally costs anywhere from $125 to maybe $175 for an unusually large house, and we usually can get those done within I would say two to four days of when we order them. After we have the pest inspection done, we usually recommend a roof inspection. That typically costs $75. And even if you’ve got a concrete tile roof that you think is perfectly fine, it’s a lifetime material, we just want to make sure that no tiles are broken or chipped or have slipped out of place and that there’s no flashing around the roof vents or other parts of the structure that have moved out of place or been damaged. We can usually get that done within a couple of days of when we order it. Assuming that these move forward since they’re more expensive, we usually get a whole house inspection, and that’s more or less like taking a used car to a mechanic and having him give it a quick overview, bumper to bumper. We’re going to have a look at the overall structure of the house, the heater, the air conditioner, the plumbing system, the electrical system, appliances, windows – quite a long list – water heater. I think you’ll agree, once you see that inspection report, which is generally around 30 pages of text and 8 to 10 pages of photos, 12 to a page, you’ve got a very good opinion of the condition of the property. And in case you were wondering, these inspectors I’m mentioning, they’re all the same ones that I used when I bought my house. When my son and his wife bought their house, they used the same people. We’ve worked with most of them for anywhere from 10 to 15 years. They’re quite good, and we’re sure you’ll be very confident and happy with the job they do. The other inspections we recommend would be a sewer line inspection, especially for an older structure, an older home where lines have been in the ground for 15 or 20 or 30 years, and especially if there’s a lot of trees or other vegetation that could affect the line going out to the street. And last but not least, if you have a chimney, a good chimney inspection and cleaning is always a great idea. If anything turns up during these inspections that need more of a specialist’s look, whether that’s plumbing, electrical, heating and air conditioning, structural stuff, roof, we can have a more detailed look at those elements of the hose and make recommendations from what’s found. So that’s basically what we’re going to focus on for inspections. Usually, we get them done in I would say 7 to 12 days after the purchase, and we’ll have a little bit of strategizing – do we want to do the appraisal of the property first or do inspections first, or perhaps do them concurrently? We’ll go over that with you as well. If you have any other questions about inspections or any part of the purchase transaction, please call, text, or email us. We’re always happy to answer them. Let’s go into more detail about your earnest money deposit with the title company. By law in California, when you write an offer to buy a home, you need to offer some amount of money as an initial deposit. And that can be anywhere as little as a thousand dollars – occasionally we’ve done five hundred dollars, but generally minimum a thousand, and more commonly about one percent of the purchase price. Occasionally, if it’s a very competitive situation, we may have suggested that you write a larger deposit, usually no more than three percent of the purchase price. Once you get your offer accepted by the seller, your deposit money needs to go to the title company, and that can be in the form of a personal check, cashier’s check, or wire. And they are going to deposit, they’re going to cash your check if you did it that way, and hold it for the period that we’re in escrow. If you cancel the purchase, assuming you’re not in default, they’re going to refund you the money. And that’s really something I want to cover in detail because, especially if you’ve made a larger deposit, two or three percent of the purchase price, a lot of buyers ask us, “Gee, what happens if I cancel? Am I going to lose my deposit? Can the seller keep my money?” and so forth. Just to give you a quick, simple answer, it’s basically almost never. We’ve been doing business for about 16 years, helping people buy and sell around 600 homes, and honestly – I’m thinking now – I think there’s maybe one occasion where someone really lost their deposit. And they knew exactly what they were doing; they just changed their mind at the last moment, after they had done inspections after they had the property appraised after everything was ready to go – just literally a day or two away from closing escrow, and they just changed their mind and canceled. In that case, they were in default, and they had the seller retain their money. But there’s plenty of safety nets that you have to make sure that that doesn’t happen. And those would include what we call contingencies, and the contingencies are more or less safety nets or exit doors, if you will, out of the transaction that you have the right to keep in place for at least 17 or 21 days after you’ve had your offer accepted. Those include physical inspection of the property; if you discover something that you weren’t aware of or that is more troubling than you thought and we can’t find a resolution for it, either through repairs or some monetary compensation, you can cancel the purchase on that basis. Yo the can cancel on the basis of inspections. If we discover something or a number of things that turn up, whether it’s in the physical inspections or the review of disclosures in the reports we receive, public information we become aware of, you can cancel on that basis as well. And the other main contingency that we have is appraisal contingency. If we offered, for example, $300,000 and the property only appraises for $285,000, if we can’t renegotiate a price that you and the seller find agreeable, you can cancel on that basis. Generally speaking, we’re going to get the property inspected and review the disclosures and reports in anywhere from 7 to 12 days after the agreement, and generally, that’s plenty of time to get it done. As far as appraisal, that usually takes a little bit longer. Sometimes we get it done within 7 to 12 days; frequently it’s more between 12 and 17 days. And last but not least, your loan approval process. If all that goes okay – the physical inspections are fine, the disclosure review is fine, the appraisal is fine – but you run into some problem getting your loan approved, that’s the last contingency that we typically remove, and we wouldn’t remove it until we know that your loan is in fact fine. So really, over the course of the generally first 17 to 21 days after agreement, we’re just sort of checking off things as we go. And we’ll be in touch every step of the way, making sure that your questions are answered, any concerns are addressed, and if we need to cancel, we will, and if we need to attempt to renegotiate, we’ll make our best effort to do that. Generally speaking, we don’t run into a lot of unforeseen events, no huge surprises and red flags, so this is all just sort of worst-case scenario that I’m discussing, but I just wanted to address it in case that’s a concern of yours. Again, assuming that all goes well, we come to the close of escrow. The lender and the title company are going to tell you how much money you need to complete the purchase, which is going to be the remainder, if any, of your down payment money, perhaps some closing costs as well, and you’ll have your initial deposit be credited towards that total amount. So, this really, I think, is probably more than you wanted to know about earnest money deposits. I hope it was helpful and addressed any concerns you have. If there are more, please call, text, or email us. Always happy to help. We wanted to give you a quick overview of what to expect during the first week of your purchase if you’re using a mortgage loan. Basically, there are three things that you’re going to want to focus on this week, and first is to meet with your lender as soon as possible. They’re actually legally required to disclose to you the terms of your loan, what your interest rate is going to be, what your monthly payment is going to be, and what the amount of money is you’re going to need at the end of the transaction for what we call your cash to close figure – any down payment and remaining closing costs. When you meet with them, they’ll also order the appraisal, and that’s what’s going to basically confirm that the property we’re buying is worth what we’re offering. If it’s not, we’ll have to go back and potentially renegotiate or even cancel the purchase. It happens rarely, but lenders just get the appraisal done to make sure that it is in the appropriate value range. The second thing you’re going to do is deposit your earnest money initial deposit with the title company. That can be in the form of a personal check or a cashier’s check, or if it’s more convenient, you can wire it to the title company. That needs to happen within three business days of acceptance. If it’s a help to you, we can arrange for a courier to pick it up, especially at your workplace, and take it to the title company – or if you do it soon enough, you can just put it in the mail. The deposit is going to get cashed by the title company. They’ll hold it, and it’ll be credited towards your down payment amount if you complete the purchase. If you don’t, that will be refunded to you if you cancel. The third thing we’re going to do is we’re going to order inspections, just to make sure that the property is in the kind of condition we want it to be, and we just learn there are, if any, issues or problems that we need to request repairs from the seller, or maybe we’re going to ask for just money instead of repairs. So once we get these three things moving forward, we’ll see the fruits of those in Week 2 and move forward in our closing process. We’ll go into a little bit more detail in individual videos about your despot, your lender process, and the inspections, but this is a good first overview. If you have any other questions, feel free to call, text, or email us. We’ll be happy to answer them. Your Offer Has Been Accepted - Now What? We just wanted to give you an overview of what to expect during your purchase transaction, and this is for people that are using a mortgage loan to get that done. We’ll have another video for people who are doing an all-cash transaction. So basically, there are three main streams you’re going to be dealing with. One is the process of working with your lender; the other is going to be the process of working with the title company, and the third is going to be what we’re going to do with the property itself. As far as once your offer gets accepted, the first thing we’re going to have you do is get with your lender as soon as possible. They need to disclose to you the terms of your mortgage, what your interest rate is going to be, what your monthly payment will be, and how much money you’re going to need out-of-pocket to complete the purchase. They’re also going to order the appraisal, which they need to get done just so we can make sure the value that you’re purchasing at is okay from the lender’s point of view. Number two is the process of getting your earnest money deposit to the title company. That needs to happen within three business days of acceptance. They’re going to cash the check you give them – it can be either personal or cashier’s check; you can also wire funds if that’s more convenient to you – and they’ll hold that there. At the end of the purchase, it’ll be credited towards your down payment and closing cost. If for some reason you can’t, it will be refunded to you. And the third thing we’re going to be doing is taking a look at the condition of the property. We’re going to order inspections of the property, and we’ll also receive disclosures from both the title company and the sellers about what they know about the condition and features and history of the property, and we’ll just make sure that there are no surprises or red flags – and if there are, we may request repairs or a dollar credit from the seller to do repairs to get that done. These three processes will be moving forward over the course of between two and four weeks. We generally need at least a couple weeks to close a purchase with a mortgage loan involved. Frequently it takes three or four weeks. Usually, no more than that, unless you’re doing down payment assistance or have some other special circumstances. We’ll shoot a series of videos going into each week one at a time in more depth and each specific topic in more detail, just in case that’s helpful. But just generally speaking, to give a quick overview, in that first week, you’re going to get your deposit to the title company, you’re going to meet the lender, and you’re going to order the inspections. Usually, it’ll be during the second week when the inspections will take place. We’ll review those inspection reports. We’ll by then have the disclosures from the settlement and the title company; we’ll look at those as well. At that point, we really should have a good sense if this is still a property you want to buy, especially since around that time we’ll also get the appraisal report back and verify the value. And assuming that we can manage everything we know at that point about value and condition and make any renegotiations on price or terms if need be to compensate for that, from there on out it’s really just a process of getting your loan finally approved by the lender. They’ll send documents over to the title company. You will go to the title company to sign those. They’ll go back to the lender for them to review, and then you’ll bring in the remainder of your down payment closing cost money. The lender will wire your mortgage loan to the title company. Once they have everything in hand, they’ll release that to the county recorder. Once the county recorder gets it done and we have confirmation of that, that’s when you’re the legal owner; that’s when you can get the keys to the property and move in. So I know that sounded like a lot, and there’s a lot of little steps, but we’re going to break this down to you in very simple terms, week by week, so you have a good overview. Thanks for your time, and if you have any questions, feel free to call, text, or email. We’ll be happy to answer them. Here's the deal, when you make your monthly mortgage payment you include a second check for the next months principal balance. Assuming you have a $300,000 mortgage, that extra payment for the principal balance would be between $400 - $800, depending on what year of the loan you are currently in. Using this strategy you can pay off your mortgage in literally half the time. That $300,000 house you bought is actually costing you closer to $600,000. Over the life of a 30 year mortgage fully half all the money you are paying to the bank is for interest. So imagine how much money you would save were you able to pay of your mortgage in 15 years instead of 30..... it's a lot. Now, not everyone can afford to make extra payments every month even though it will save you so much money. However, there is a way to realize a portion of those savings without spending any extra money every month. Want to hear it? Great! All you have to do is pay half of your mortgage payment early on the 15th of the month and the second half on the 1st (your usual payment date). By making a portion of your payment early there is less principal for the bank to charge you interest on. With the "magic" of compounding interest the savings you can realize are pretty spectacular, especially considering it costs you nothing more than the price of a second check. Are Sacramento Home Prices on the Rise? The summer is in full swing and things are starting to calm down a bit, so it's the perfect time for yet another Sacramento market update! It's been a very strong year so far. We've seen an increase in average prices between 7%-9%. The increases have been stronger in the lower and middle price ranges, and there is still a strong intolerance for overpriced homes, especially in the higher price ranges. Generally, you need to be careful about overpricing if you are selling in our current market. <p">We've seen a significant increase in the number of FHA home buyers, as there are 27.5% more in the month of June alone. This has effectively resulted in a rise in offers over list price, which is great news for sellers. The average time on market is up a bit from 2012 and 2013, but homes are still moving quickly at only 30 days. This may have to do with the fact that inventory is under two months right now, which is the sign of an extreme seller's market! <p">Despite current low levels on available homes, we have seen a slight increase in listings, as people love to list their homes in June and July. The good news is sales are starting to slow a bit too, which should result in a larger selection of homes for the buyers still looking. There is more good news for our market. The average price per square foot is up 8% since a year ago at this time and the volume of short sales and REO's is down. This isn't great news for buyers looking to get a great deal, as these homes are down to about 5% of the market each, meaning 90% of available homes aren't distressed sales. As a result, the number of cash transactions has also decreased, as they made up only 16% of all transactions. If you have any questions about current market conditions, or if you need real estate assistance of any kind, give us a call or shoot us an email. We would love to hear from you! What Do Recent Sacramento Market Conditions Mean for You? It's that time again! The numbers are in, so we want to give you a quick market update for the Sacramento area! Basically, we are seeing what we expected to: inventory is increasing, sales activity is up, and prices are gradually appreciating. We could dive into specific data, but what's important is that you get a detailed analysis specific to your home and neighborhood, because the numbers can vary greatly. We usually see more inventory put on the market starting in June, before this rise in listings starts to plateau around July. When that time comes, market activity is still very high, but it begins to taper off a bit toward autumn and the end of the year. 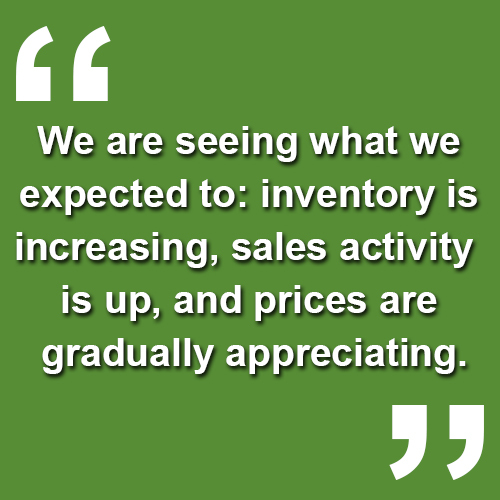 The one thing we can really focus on is the supply of inventory relative to demand. Supply in the $200K-$300K price range sits at only 1.2 months and supply for the $300K-$400K price range is at 1.5 months, which is fantastic news for homeowners in those price ranges! You have a lot of leverage if you plan on selling in the Sacramento area in the near future! If you have any questions about specific market conditions in your area, or if you need real estate assistance of any kind, don't hesitate to reach out to us. We can help you make the most of the market, whether you're buying or selling. We would love to hear from you! Are You About to Lose a Great Deal of Purchasing Power? Today, I want to briefly discuss a topic that will be of great importance for homeowners for years to come: interest rates. 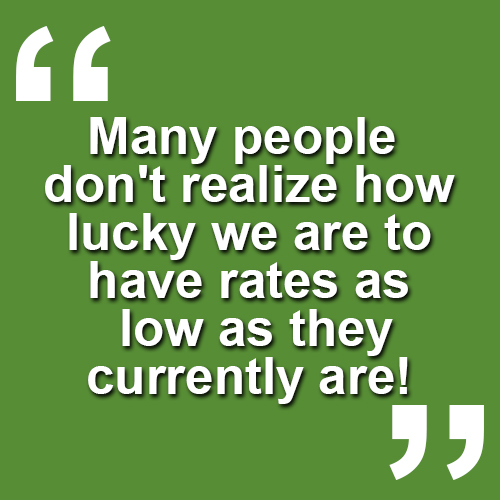 Many people don't realize how lucky we are to have rates as low as they currently are! Over the last few years, we've been within half a percent of all-time historic lows. This is not sustainable, and you certainly can't expect it to last for much longer. In fact, the Fed has hinted many times that they plan to raise rates in the near future. When they do, rates will likely rise to as high as 6%, if not more! When I first got started in real estate, rates were around 8% and no one complained or even thought twice about it. Going further back, rates were as high as 16% in the 1980s, and there was no down-payment assistance! Obviously then, if rates rise to 6% it won't be the end of the world. However, those few points will greatly affect your affordability. If you plan on making a purchase, you need to act soon! If interest rates rise even .5%, you lose 5% of your purchasing power! If you were shopping for a home for $300,000, now you can only afford a home for $285,000. Meanwhile, there's no sign that appreciation will slow down anytime soon, so you'll lose even more purchasing power! In short, now is the time to get more home for less money, period. Waiting is only going to cost you! If you have any questions about where rates are heading, or if you need real estate assistance of any kind, don't hesitate to give me a call or shoot me an email. I would love to hear from you!